One of THE country classics, though it is generally associated with Patti Paige, who had a no.1 US hit with her more pop version in 1950. The origins of "Tennessee Waltz" are unclear. It was probably inspired by Bill Monroe's "Kentucky Walz," with Pee Wee King and Redd Stewart providing lyrics to their own "No Name Waltz" tune in 1946. 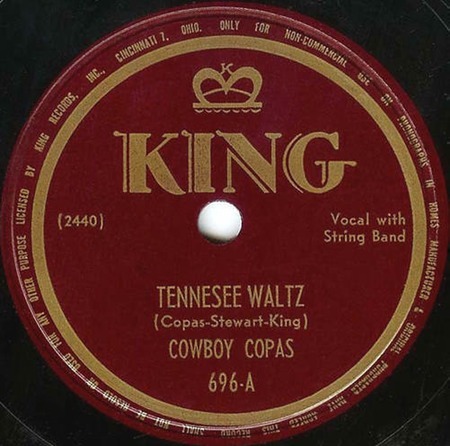 Cowboy Copas, sometime singer with Pee Wee King's Golden West Cowboys, probably recorded the number first in April 1947, though his version was not released until March 1948 (with the label showing the title as "Tennesee Waltz" -- note the missing "s" -- and strangely indicating Copas as one of the writers) on King 696. Pee Wee King's own version, recorded with His Golden West Cowboys, was recorded in December 1947, released in January 1948, and entered the US Country charts in April 1948, peaking at number 3. Co-writer Redd Stewart, who played fiddle with the Cowboys, sang the lead. Tom Parker was Pee Wee King's road manager in the early 1940s. He went on to manage Eddy Arnold, a former Cowboy himself, and later, of course, Elvis. On 17 February, 1965, Governor Frank Clement proclaimed "Tennessee Waltz" as the fourth Tennessee state song.